Are the free Xbox Games With Gold titles for September 2018 any good? After a fantastic month in August seeing Forza Horizon 2, For Honour, Dead Space 3 and Disney’s Epic Mickey 2: The Power of Two given away for absolutely no extra cost whatsoever, it’s hard to imagine another month of free Xbox titles being quite as giving. Now September’s Xbox Games With Gold freebies have finally been announced, are we in for another cracking month or is it just a mediocre showing from the titles on offer? Prisons, the underrated buildings of our society. They keep inside the folks you don’t want roaming outside. But what does it take to run one smoothly? Well now it’s up to you to find out as this month’s title will have you constructing, staffing and running your very own prison. Can you create a HMP Utopia that runs perfectly on a day to day basis, or will the riots, fires, violence and contraband become too much to handle? In Prison Architect, this month’s management sim, you’ll be in control of it all, from minute details such as controlling water and power throughout the establishment, to setting patrol routes for your officers and dealing with prisoners’ needs and wants, with many more time restraining issues to balance in-between. Is it any good though… yes, yes, it’s bloody fantastic! In fact, it may just be one of the best management sims available on Xbox One. With a brilliant story-based tutorial section and the constant need to be on top of every decision and action you make, there is never a time in which players are left to feel completely comfortable with their prison, and with one small mistake enough to lose control of your prison, the tension is always high every step of the way. If you’re a fan of simulation experiences this is definitely one you don’t want to miss. Whilst twin-stick shooters may not be everyone’s cup of tea, Livelock certainly surprised many when it released two years ago, with solid gameplay and fluid controls as standard. This top-down shooter pits players into battle as they try to stop the cycle of infinite war between machines. As one of the remaining Capital Intellects, your role is to unlock Eden and revive humanity, and it can all be done in co-op if that’s how you prefer. Livelock may not be the most original co-op adventure out there, or even anything overly fresh in the top-down twin-stick shooter category, but in no way is it a bad game and there is definitely plenty of fun to be had should you be going in as a team. It’s fun, it’s easy to play, and any fan of top-down shooters would be crazy to ignore this one if you’re yet to jump in. Do I really need to tell you why you need to download a LEGO Star Wars title the moment it’s available for free? Whilst it may not have been the first series to gain a LEGO following, it certainly goes without question to say that LEGO Star Wars was the start of the huge LEGO trend in gaming and for good reason. Much like it’s previous LEGO adventures, LEGO Star Wars III brings yet more classic gameplay, humorous cutscenes, favourite characters, clever unlockables and hours and hours of fun throughout it’s Clone Wars storyline, all of which can be enjoyed in local co-op. With some of the finest LEGO games coming from the Star Wars series this is one that all gamers should jump at. Whether you’re a fan of LEGO, Star Wars or simply classic titles to add to a growing games collection, this is one you definitely need on your console this month. I don’t like to criticise classic games very often, especially when many of the most classic titles spawned the progress we’ve seen in gaming today, but let’s be honest, whilst there will be some out there who will feel like screaming at my recommendation, chances are there aren’t many of us who will plan on playing such a vintage title with the titles due out over the next few weeks and months. Whilst there is no harm in downloading the Sega Vintage Collection: Monster World to your console, this certainly doesn’t make for a great ending to the month given the quality of some of the other titles on offer. Outdated visuals and gameplay are both in place and so it’s not like we’re finding a title truly capable of competing with last month’s epic entries. Is it worth your time even downloading Monster World this month? That depends on what you enjoy from your games, but for many, this title will be one that isn’t worth bothering with. 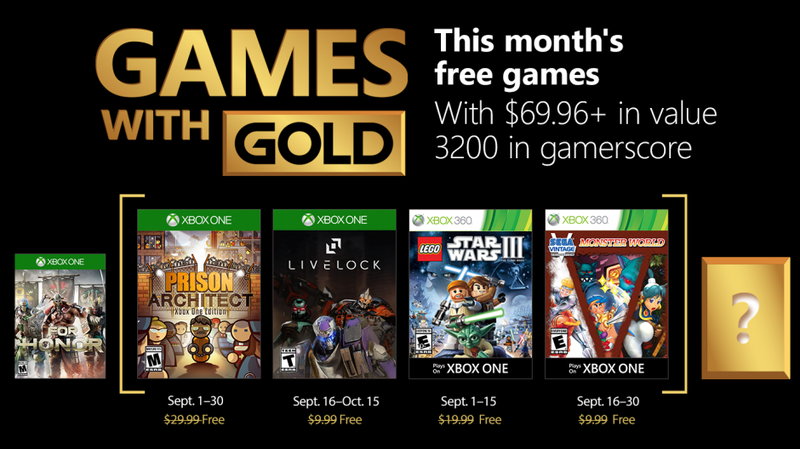 So, there we have it, another month of Xbox Live Games With Gold and our thoughts on the free titles we will be able to enjoy with an active Xbox Live Gold subscription? What are your thoughts on this months free Xbox One and Xbox 360 titles? Will you be spending time with them over the coming weeks? Let us know in the comments below or via our usual social channels.